xplorer² is a tabbed, dual-pane file manager with tons of features, including folder size view, window layout management, item filtering, folder comparison/synchronization, batch renaming, and file split, merge and shred. Search function includes ability to look for text inside files, and text and script editors, as well as HTML, multimedia and image file preview. 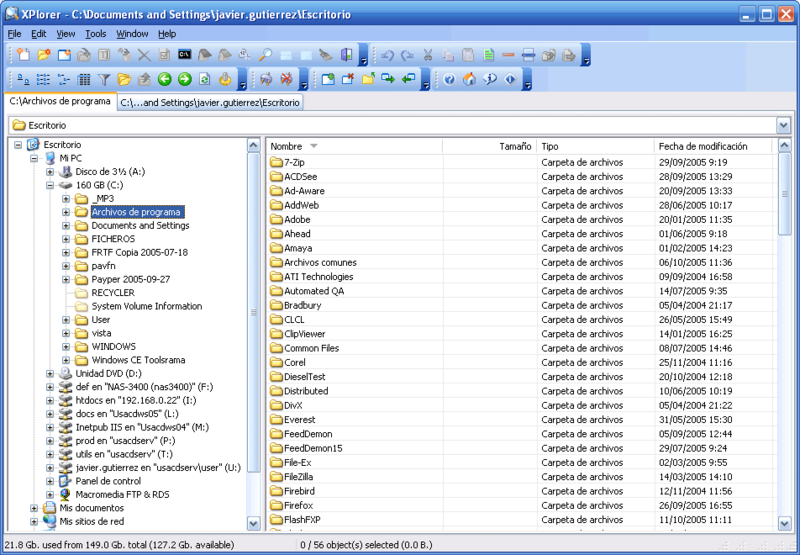 xplorer² lite portable is a portable wrapper made by SmithTechSoftware that writes settings to the application folder instead of the registry. Note: the latest version of xplorer² lite available from the program's site maybe still compatible with SmithTechSoftware's portable wrapper (see the official forum topic and comments below). How to extract: Download the self-extracting EXE and extract to a folder of your choice. Launch xplorer2 Portable.exe. 3. Install v1.8.1.4, select your language, uncheck all options, becareful to not install the toolbar. 5. Copy & save installed files except "uninstall.exe". 8. Delete all files in App > xplorer2_lite. 9. Paste files from Xplorer2 v1.8.1.4 in it's place. actually, they're still offering the lite version, and the latest version is 1.8.1.4 but it's not that easy to find. you have to go to "downloads" and then select "download mirrors" to the left. This rules! I'm a long term fan. I'll check out cubic explorer as i'm always lookin for nice stuff. I personally recommend Cubic Explorer, as it is tabbed and customizable. It also has a nice drop stack feature. It is also VERY fast, usually it is faster than windows explorer. J44xm - Just make a batch file that has something like "start /MAX xplorer2.exe" and it should start maximized. This method works with almost any program. Quick nice and quick. So far it works when I want 2 panes as Ultra Explorer is getting laggy. Nice. Only issue for me is minor: I can't get it started maximized. In order to configure this to use a portable text editor with the F4 hotkey, you must check "Don't lock browsed folders" on the Advanced tab in the options, and then type a relative path in the "External Editor" box. This does, however, cause the DOS console to lose synchronization with the current folder. The problem lies in how it tries to call the editor from the currently open directory. This works fine if you're working with files on your jumpdrive, but will break if you go to a different drive letter. Also, it will erase the settings for xplorer2 installs on the machine. be aware that you'll have a bit of tweaking to do to your settings when swapping from an installed version to the portable. anyone knows if there's a tut on how to create something like this on the pro install? thanks. again, nice job on this one, works perfectly. eeek. the free 'light' version is too disabled, why tease us with useless menus. i'd say it's more like nagware then freeware. ultraexplorer is actually portable and totally free. This is great. It writes to the registry on startup and then erases its own entries at program exit. Very neat idea that I wish other software could implement.